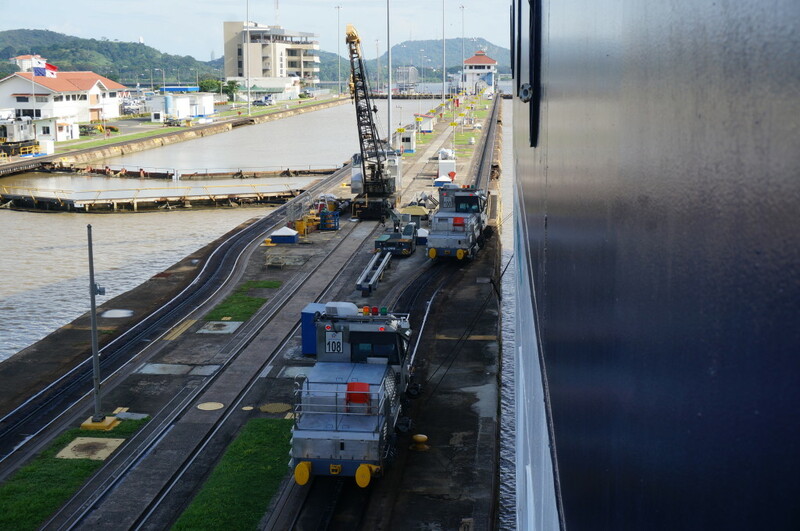 This is a three-part post about taking a Panama Canal cruise full transit. For our own personal experience transiting the Panama Canal on the Celebrity Infinity, simply continue reading. For Panama Canal cruise tips: skip here. For our brief Celebrity Infinity review of the Panama Canal transit: skip to the end. 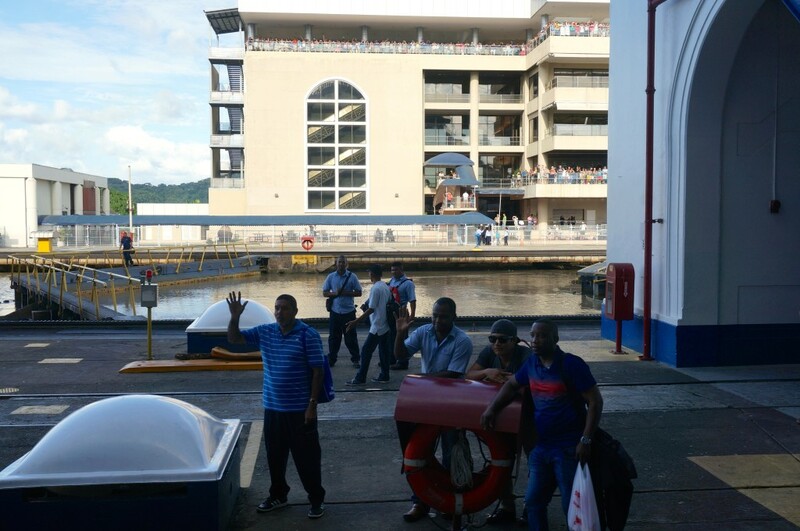 The year 2014 marked the 100-year anniversary of the Panama Canal and we were happy to commemorate its centennial when we visited the famed waterway back in March, earlier in our trip. Then, we went to the visitor center at the Miraflores locks and watched a few ships transit them, which grew our fascination of the engineering marvel. As we witnessed this spectacle earlier on our trip, we never imagined that we would be making the Panama Canal transit ourselves, only nine months later. Yet here we were, now back in Colon Panama aboard the Celebrity Infinity, now in December, ready to make the bucket list crossing of continents from the Atlantic to the Pacific. To be honest, we weren’t really that excited to be transiting the canal. We booked this repositioning cruise deal, as we often do, simply because it was a comfortable, convenient and economical way for us to get from one place on the map to another. Yet for many people, the entire reason behind booking such a cruise is for The Day you transit the Panama Canal. For us, the Canal was just an added bonus as we were making our way down from Florida to Chile. Yet, it ended up being much more than that. The growing excitement of fellow passengers was perhaps contagious. By the night before our crossing, we were getting thoroughly geeked up for our transit. The Celebrity Infinity ran the 1987 David McCullough NOVA special – A Man, a Plan, a Canal – in the theatre and on the in-room TVs, which served up fun facts (alongside its nostalgic 1980’s production value) to further our interest in the following day’s crossing. While most ships wait their turn to enter the canal, based upon their arrival, cruise ships tend to pay extra to ensure a daytime crossing, which was also evident in the taxes section of our cruise payment. During the evening before our transit, the Infinity revealed our slotted time to enter, to the appeasement of many curious passengers that can now review and plan their day. It would be an early morning to begin the journey, so the NOVA documentary would help send us to sleep as it prepared us with details of what was to come. Finally the day was here. As the sun began peaking its way into the cracks of our blinds, we arose to see our position entering the canal. The pilot boat should have arrived an hour earlier (around 5:30 am), so we figured that we had missed this event which kickstarts the day. 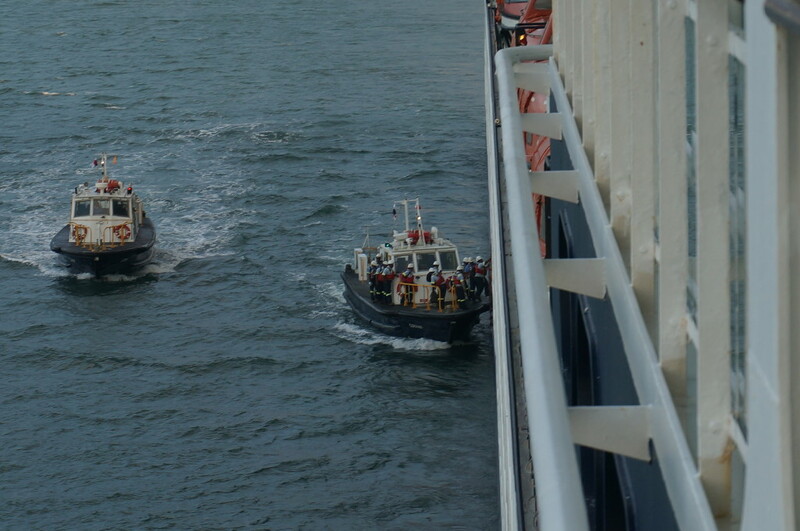 But it was right then, when we spotted the small pilot boat motoring up to our megaship to drop off the pilot! So what’s this pilot all about? It was explained that there are only two instances that the ship’s captain does not have authority over the boat: (1) when the ship is in dry dock for repairs and (2) when transiting the Panama Canal. A special canal pilot actually comes onto the ship to navigate through the canal and locks. We caught all the action of him jumping aboard the Infinity. What a cool way to jumpstart the day! We were officially excited and ready to take it all in. Brief showers began to pass but we didn’t mind. As we left the Caribbean Sea and approaching the canal, a beautiful rainbow further taunted us to get out of bed and take in the experience. We were ready to enter. It was time. 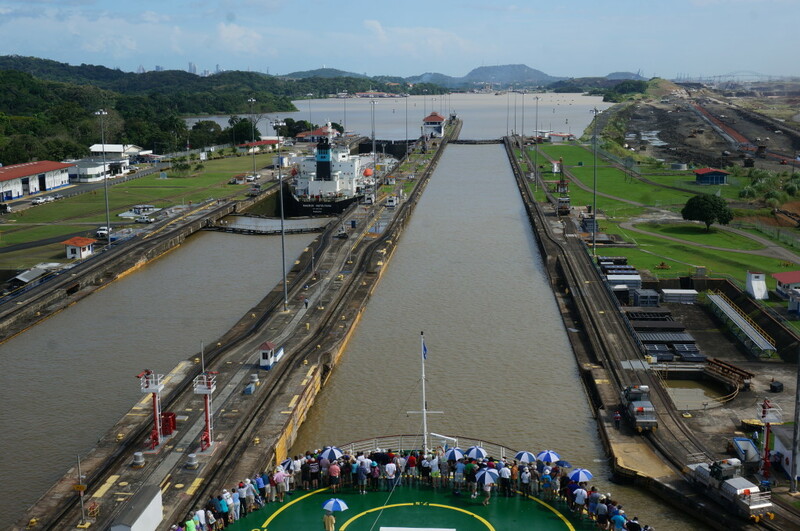 The first of three locks we would reach was the Gatún Locks, which was nearly at the mouth of the Caribbean Sea. This lock would lift us up from the Caribbean Sea and deposit us into Lago Gatún. The closed circuit TVs on the ship provided commentary and the bow of the ship (normally off limits) was open to passengers. But perhaps it was high atop the upper decks of the ship that perhaps provided the best views. Upon the upper deck, you could really get a good vantage point of exactly how tight a squeeze this would be for the Celebrity Infinity. You see, at 964.6 feet in length and 105.6 feet wide, the Infinity is what is known as a Panamax vessel, as it is the maximum size able to fit in the Panama Canal. The locks are only 110 feet wide, so this only leaves about two feet on either side to spare! Once the new portions of the canal open in 2015, these dimensions will change, so it was kind of neat to do this transit on a Panamax ship in the original canal, 100 years after it was opened. The Gatún Locks opened up. We smoothly glided in as if a hand had slipped into a perfectly sized glove. The boat was roped-up to devices that looked like little train engines that appeared to be pulling us in. In actuality, we learned these were more so helping to steer and straighten the massive ship as it entered. Once inside, the gates slowly sealed closed behind us, water began to be pumped in, and the Celebrity Infinity began to rise. 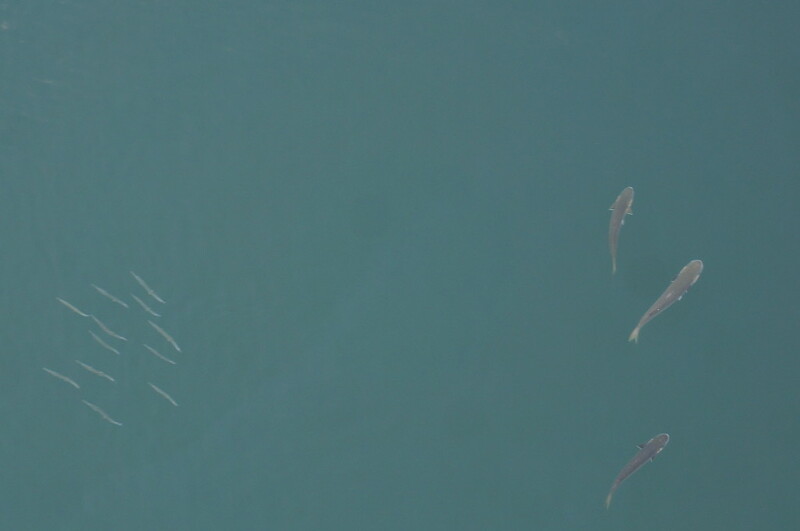 We even noticed some fish in the lock rising right along with us, getting a lift from the Caribbean Sea into the Canal. It took what seemed like about an hour to complete this process in the Gatún Locks. From our stateroom balcony, we shouted “Hola!” to some of the canal workers. To our surprise, they seemed genuinely happy to see us, greeted us with big smiles and hollered back “Bienvenidos a Panama!” We would’ve thought since they’re doing this every day, the canal workers must grow bored and tired of such antics. Yet most of the workers were really excited and playful, having short conversations with us in broken Spanish. Yes, we were that close! In the distance we saw “chicken busses” pass by. These tricked-out old American school busses were often our primary means of transportation throughout the three-month overland journey from Mexico to Panama we had embarked on earlier during this same year. It was an interesting throwback to a prior time in our trip to view the rough and chaotic means of transport we always relied on, now from the balcony stateroom of our refined luxury cruise. And while the cruise is undoubtedly a nicer means of transportation in everyway imaginable, these crazy chicken busses also have an adventurous & fun allure to them. It was interesting to recollect on these two means of transportation we often use, that couldn’t be any more different from one another. Once in Lake Gatún, we would slowly cruise through for a few hours before reaching the next set of locks. In the past, when I’ve thought of the Panama “Canal,” I’ve literally envisioned it as a long skinny “canal” the entire way slicing through Panama. This was not the case. 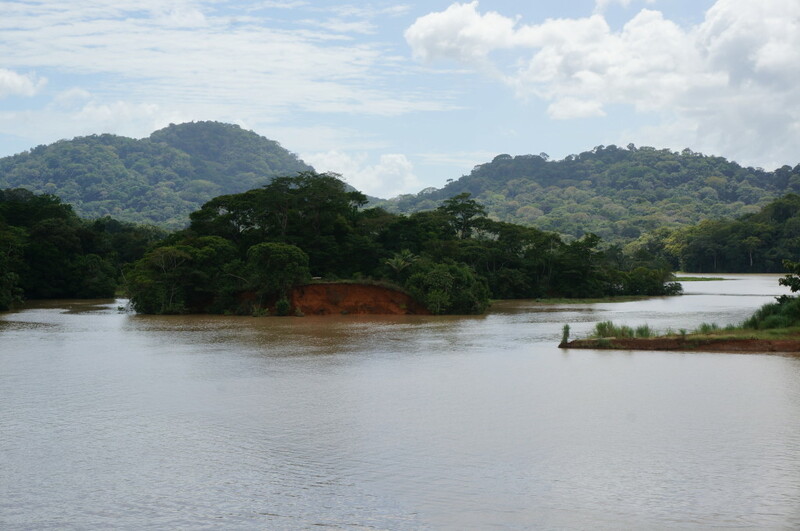 We chugged along through this massive lake that was very wide at points, passing lush jungle, feeder rivers, overgrown islands, and even hilly, nearly mountainous terrain. Enormous freighters occasionally passed by in the opposite direction as tropical birds soared overhead. It would be a very slow and peaceful voyage of 37.5 kilometers down this most pleasant stretch of the Panama Canal. While the locks and the canal itself are the star attractions, we found that leisurely cruising through the Lago Gatún to be an unexpected delight. This relaxing jungle voyage through the curvy lake was equally awesome for us. Meanwhile, life on the Celebrity Infinity carried on during this hot and humid day. Passengers cooled off in the pool, some more active and heat-resistant folks ran the jogging track, while others staked out a window inside a much cooler interior bar. The main dining room eventually opened for lunch and we were fortunate enough to snag a table with a fantastic view to marvel at the beautiful Panama scenery passing us by as we rejoined some friends to each chow down on a three-course feast. The wide lake ultimately began to narrow and the pilot navigated the ship into the actual canal section. We roamed all around the many decks of the ship to enjoy the transit at different vantage points. Eventually we reached the Pedro Miguel locks and began our first of two descents. For us, it was time to crack open some brews to accompany this once-in-a-lifetime experience. We continued to be amazed at just how close the ship comes to the sides. They even blasted a few reminders over the loud speakers, reminding passengers “For your safety, please do not touch the sides of the canal.” That’s how close we were! 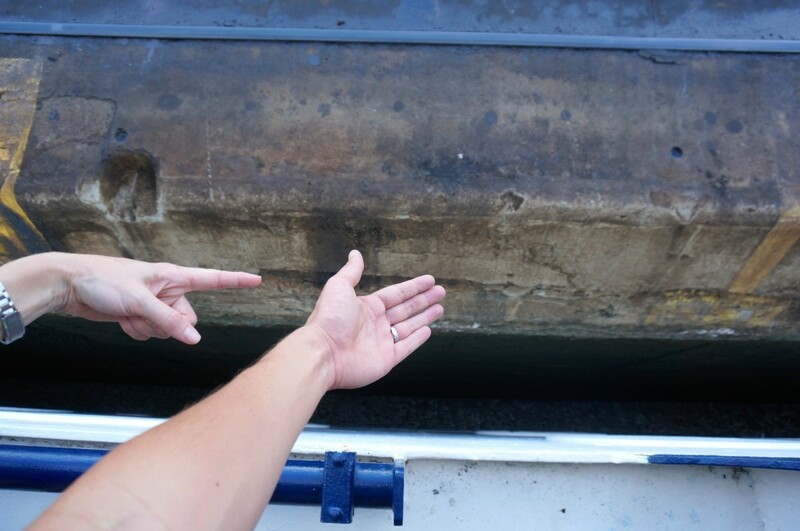 At one point, we think the ship may have even accidentally brushed up against the side of the canal. Once docked later in port, later on the cruise’s itinerary, I noticed them painting over some scratches on the ship, further corroborating our suspicions. With this action-packed cruise day, it was time for a little snack to compliment our beers. So we thought it would be fun to take advantage of the gratis room service available on the Infinity and had some pizzas delivered directly to our stateroom. It was a little bit surreal to enjoy pizza delivery as we transited the famous canal. The third and final set of locks was the Miraflores Locks, where we had previously visited in back in March. Here, we waved to all the tourists crowded on the stands at the visitor center, where we had been waving back to ships ourselves just months earlier. It’s a little bit of a peculiar scene here. All the tourists on the cruise ship are taking pictures of all the tourists at the Miraflores Visitor Center, as all the tourists at the visitor center were taking their best shots of our transiting ship. Rather than attempt to shout over to the tourist hoards at the visitor center, we instead tried to again carry on conversations with the workers that were nearly eye-level with us on the side of the ship. This final transit had come to an end and we could see Panama’s towering skyline off in the distance. We passed under the Bridge of the Americas, which seemed to be nerve-rackingly close to the top of the ship. Almost undetectable, we then began to pick up speed. The next time we glanced over the side of the Infinity, we were passing all the freighters lining up in the Pacific awaiting their transit to the Caribbean. The sun set down behind the Isla Tobaga, a familiar island for us to reflect back on, since we had spent a beach day there earlier in the year. And before we knew it, we were in open ocean. The transit was complete. We will remember this epic day crossing the Panama Canal on the Celebrity Infinity for the rest of our lives. This usually isn’t the type of activity that thrills us, yet our excitement and enjoyment on this day were at peak levels. We now completely understand the allure of this awesome voyage and relished every minute of it. There’s actually quite of few Panama Canal Cruise Tips you should be aware of if you are considering embarking on the transit. 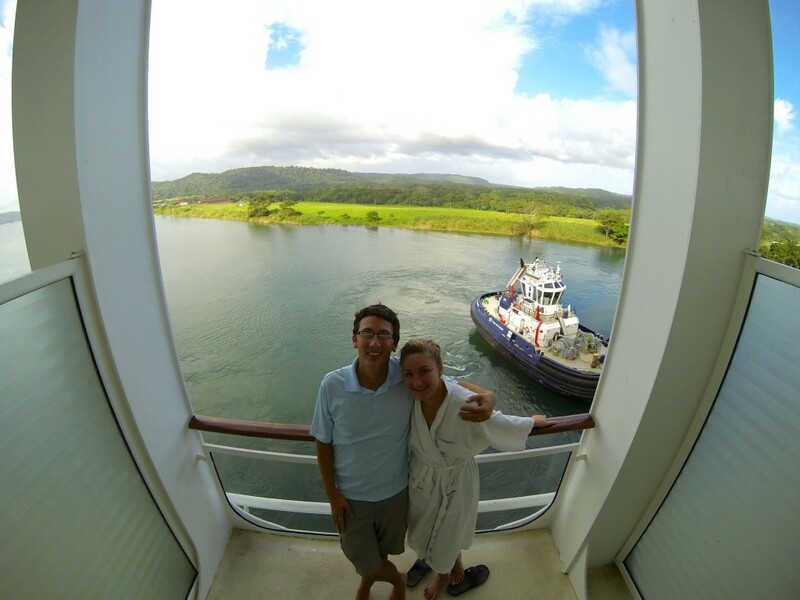 We jotted down notes throughout our voyage to assemble a collection of Panama Canal cruise tips for anyone who is considering this epic voyage. 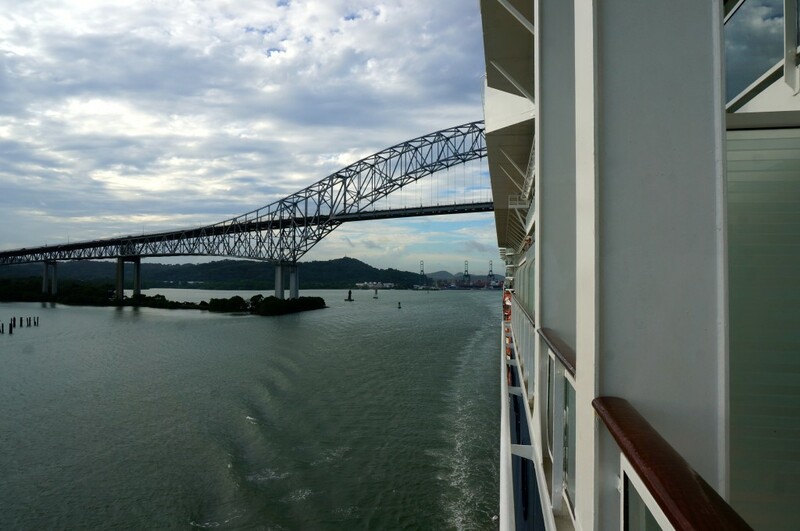 We hope you find these Panama Canal cruise tips to be helpful. And if you’ve done the transit yourself and have any Panama Canal cruise tips of your own, we’d love to hear about them in the comments section below. Choose a Ship to Transit the Panama Canal: The ship you choose can make or break your experience so be sure to do your research. We recommend the Celebrity Infinity and loved it (see review below). For whatever ship you may be taking, check review sites such as CruiseCritic.com for opinions and to vet out a sailing that fits your style and interests. Be sure to review the Panama Canal transits in particular too and not just the cruise ship itself. Full or Partial Transit of the Panama Canal: There are many cruise lines making the Panama Canal transit throughout the year. 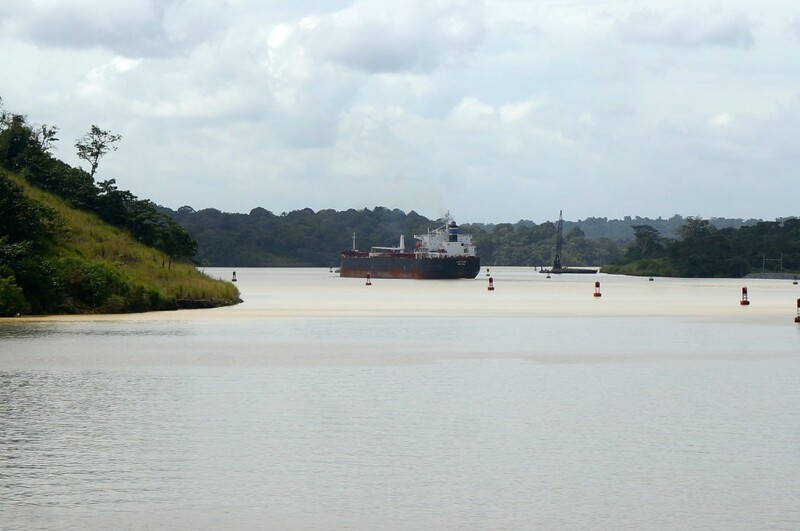 Some ships make a partial transit, going up the Gatun Locks cruising the lake and returning down the Gatun locks. While other ships make the full transit, as described in this post. Panama Canal Cruise Cost: At the time of writing, prices range from as low as $600 for a partial transit on a 10-day cruise. Prices for full transits were a bit higher and go on well into the thousands of dollars, depending on the ship, stateroom, itinerary and other factors. The absolute lowest rock bottom cost for a full transit is currently about $800 per person for an interior stateroom on a two week cruise (not including taxes, port charges, gratuities, or flights). When you consider this comes out to about $50 per person per day, you’ll realize this is of incredible value! You can book with the cruise lines directly but you can sometimes get lower prices and better perks by booking with an agency. To search for a Panama Canal cruise with a low price, we recomend using VacationsToGo.com and we’ve detailed our process in this guide to searching for the best cruise deals. 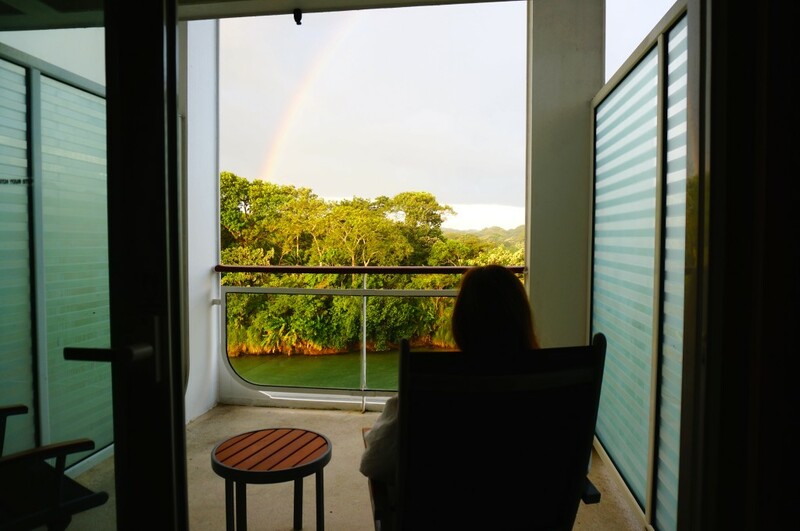 Choosing the Port vs Starboard Side for the Panama Canal Transit: If you’re fortunate enough to have a veranda stateroom, it is very pleasant to take in part of the experience right from your private balcony. If transiting from the Caribbean to the Pacific, the port (left) side of the ship may be a better consideration as this is the side that will have views of Panama City and where you’ll pass by the Miraflores Visitor Center. If transiting from the Pacific to the Caribbean, the opposite is true, and you may want to consider a Starboard (right side) room. However, it’s really not such a big deal since you’ll likely not be spending the entire time in your stateroom anyway. Our stateroom balcony was not on the favored side of the ship and we still really enjoyed the view. Yet those with mobility issues may want to more strongly consider choosing a veranda stateroom on the Panama City side. Try to Get a Free Balcony Upgrade: Don’t have a balcony? 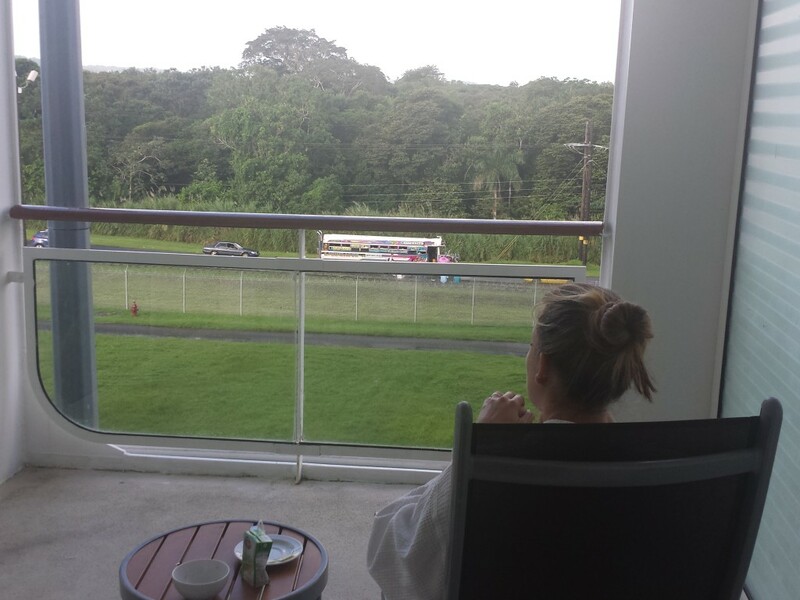 It can be nice to have a balcony during the Panama Canal transit to relax on and soak in the surroundings. But they can get pricey. It’s very difficult these days to actually get a free balcony upgrade but we somehow managed to get one on this cruise and three of the past four cruises we’ve been. See our separate post on 10 Secrets to Get a Free Balcony Upgrade on a Cruise where we reveal our tips to increase your chances. Prepare for Weather: Panama is hot. Really hot. And humid. This is a very important Panama Canal cruise tip! Load up on the sun screen and bring a good hat to help cover up. If you have an interior cabin, do not plan on hanging outside on a deck the entire day, as you may melt. No, really, it gets scorching hot. Have an inside space in mind to cool off in the air conditioning. For prime spots, you may need to get up very early to claim your space. But don’t be a jerk and leave personal items on a seat unattended all day long, only to come and go periodically as you please. Also, be aware that it does rain in tropical climates and can be a common occurrence during Panama Canal transits. Don’t let this ruin your day and instead be prepared with some rain gear so you can step outside to have a look. 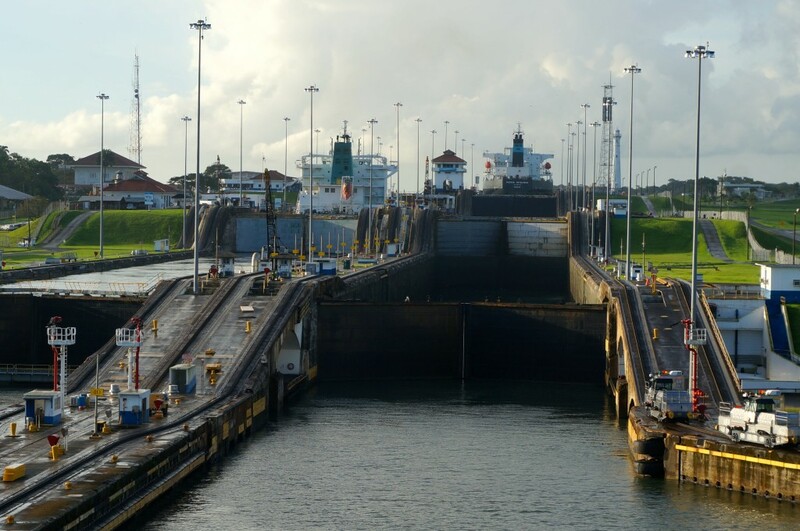 Learn About the Panama Canal: Before your transit, take some time to educate yourself a bit about the canal. 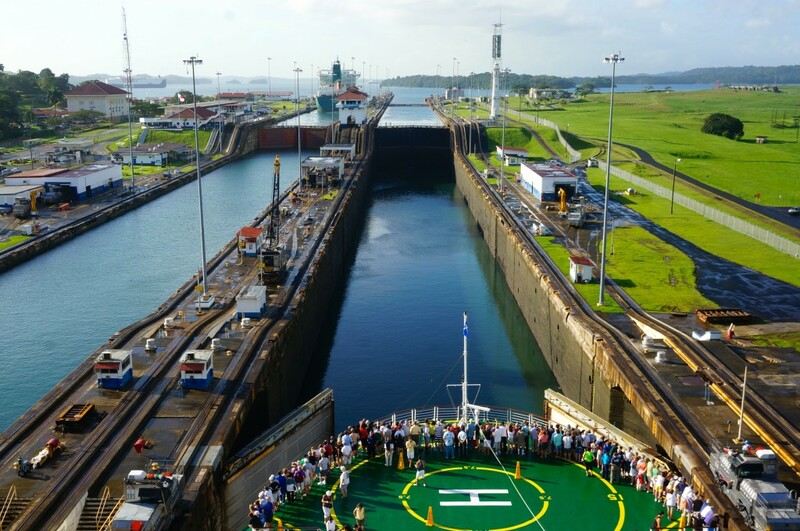 Read a book, watch a documentary, take in a lecture, read up on the Canal online, or go to the visitor center if possible when docked in Panama before your transit. Having some knowledge about the Panama Canal really enhances your experience to understand the inner-workings of this engineering feat in addition to all the absolutely incredible history behind it all. It truly is fascinating. Don’t Book a Panama Canal Tour Excursion in Colon: This Panama Canal cruise tip will save you money and repetition. Many cruise ships dock for a day in Colon before or after the Panama Canal transit. A popular (and expensive) shore excursion that is offered is to take a boat tour of the Panama Canal. It sounds nice at first, but you’re essentially going to be doing the exact same thing while on the cruise ship. It’s going to be the same route, same locks, same transit, just a different smaller boat providing different narration. In our opinion, it’s a bit of overkill. Instead we recommend taking the opportunity in Colon to take a different shore excursion. 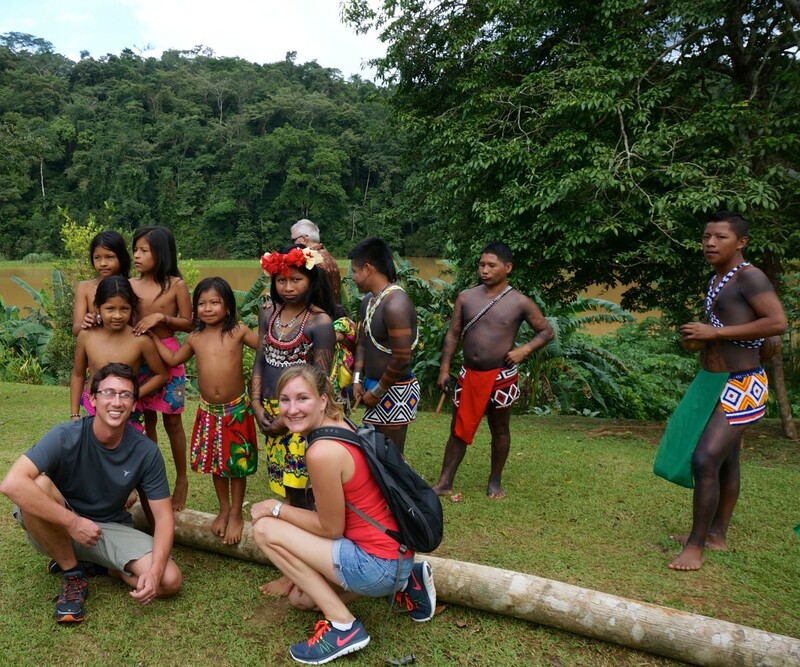 Instead, we can personally highly recommend the Embera Indian Tour. Other Colon shore excursions you may want to consider is going to the MiraFlores Locks and Visitor Center, the Gatun Locks, or taking a Panama City Tour. Consider Rising Early: The night before your transit, you will receive the approximate times of all the major moments. This begins with the pilot coming aboard the ship. If you wish to take in this spectacle, be sure to set an alarm to wake up early for the chance of seeing it. But bear in mind that the times will likely change, plus or minus a couple of hours so don’t plan your entire day around the schedule provided. 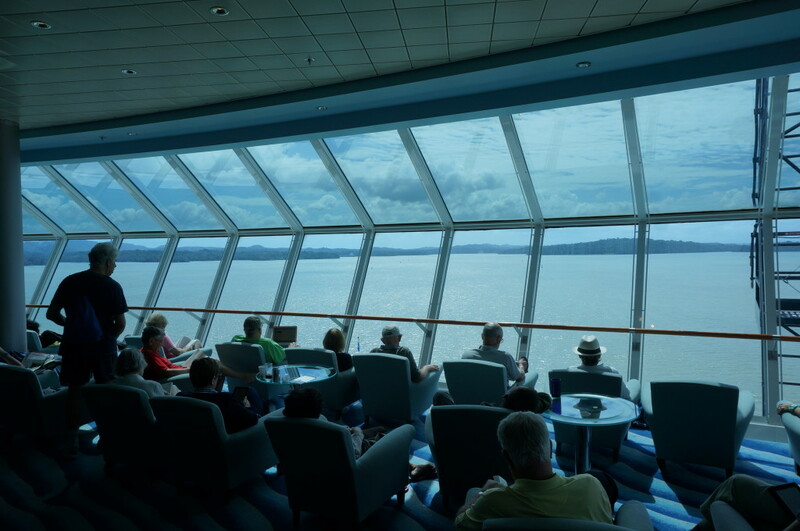 Best Places on the Ship During Panama Canal Transit: On the day of the cruise, be sure to experience the transit from many different vantage points. We strongly recommend not staying in one place. Going through the locks on the side of a lower deck provided a completely different experience than high atop an upper deck, yet both were great. Another prime location is on the bow of the ship, although it can get crowded. An often-overlooked place to take it all in is on the stern (the back) of the ship, which tends to be void of crowds and full of unobstructed panoramic views of the experience. Head to the back of the ship and watch the locks close up behind you. Charge Your Devices: In this digital age that we currently live in, you may have a camera or cell phone with you to snap a few pictures. So don’t forget to charge them the night before so that you’ll wake up with batteries at 100%, enabling you to capture all those memorable moments of the transit. Many cruise only have one outlet in the stateroom. Consider buying a travel power strip like this which will give you three additional outlets and two USB ports to use for charging. Mobile Phone Coverage on Panama Canal Cruise: Unlike a typical sea day in the open waters, you can pick up cell phone service when transiting the Panama Canal if you have a roaming package enabled with your cell phone carrier. We checked our phone periodically throughout the transit. Although we had some slow and sporadic phone coverage here and there, it wasn’t until approaching the Miraflores Locks that we picked up a solidly reliable signal, which lasted until well into the Pacific. So if you need to check your email or simply update your Facebook status with a pic of you crossing the Panama Canal, this is the time to do it. Don’t expect 3G or 4G data speeds though, but it was fast enough. Best Lunch Options for Panama Canal Transit: During our crossing, it seemed that most passengers preferred the buffet. This caused some crowds and a bit of clustering when trying to get your hands on the salad tongs. Tables near a window were scooped up quickly and people tended to linger. Instead, consider two other much more attractive options. (1) The main dining room will be open for lunch. Check the daily itinerary to determine when the main dining room opens up and head there right at that time, or perhaps a few minutes before. There will be little-to-no lines and you’ll almost be assured of a nice cool window seat to stare out into the Panamanian jungle as the waitstaff refills your iced tea. (2) If you have a veranda stateroom, consider ordering room service to enjoy from the comfort of your cabin or on the balcony itself. And remember, with most cruises room service is typically complimentary. 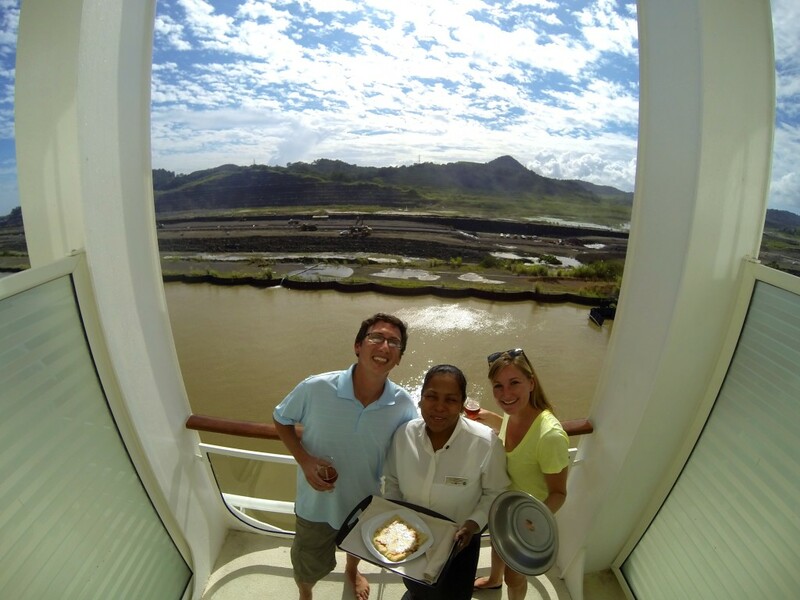 The Best Panama Canal Cruise Tip: The best tip we can give is to simply to enjoy the day, however it suits you. This is your day. It’s your transit. Make the most of it and enjoy. 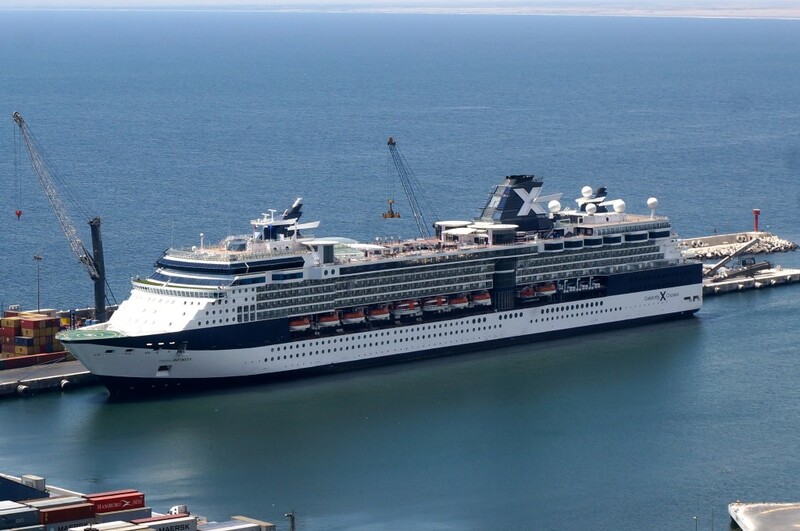 More Cruise Tips: The cruise tips mentioned above are specifically for Panama Canal cruise tips. We have an entire other blog post that you may find helpful that contains our Top 50 Cruise Tips. 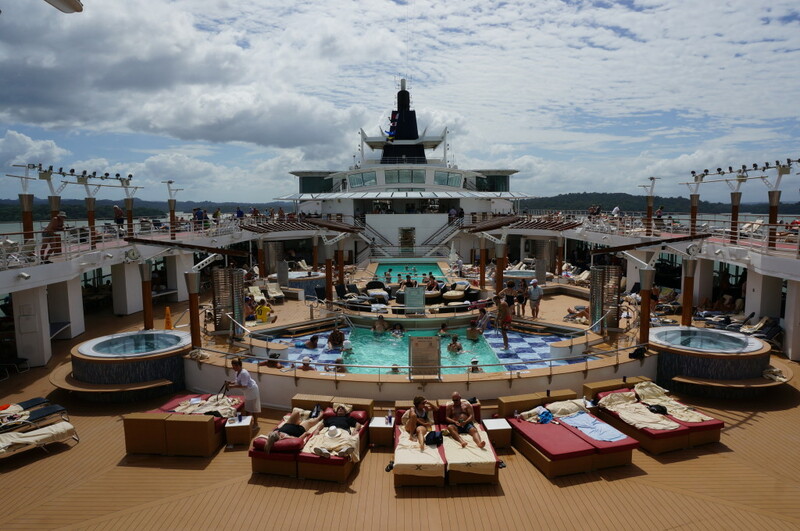 We sailed through the Panama Canal on the Celebrity Infinity from Fort Lauderdale, Florida to Valparaiso (near Santiago), Chile and give the entire experience an excellent review. This was our second repositioning cruise on Celebrity and we’re finding that they really deliver on their “modern luxury” branding. Perhaps most of all, we thoroughly appreciate and notice Celebrity’s extreme attention to detail throughout our entire experience on the ship. The exotic South American ports of call (which included an overnight in Lima / Callao) during our cruise provided for a most interesting itinerary, docking in places not often visited by cruise ships. A highlight for us was swimming with the sea lions in Peru. We found that dining on the Celebrity Infinity to be mostly of very good cuisine quality, with a few excellent standouts. Entertainment was hit or miss, but that’s a matter of opinion (and we are not the target audience, being in our early 30’s). All of the crew members on the Infinity were pretty incredible, which greatly enhanced our experience during the two week voyage and our day transiting the Canal. Lectures and activities on the ship during sea days and in the evenings were among the best we’ve experienced on a cruise. There was always something to do and the CelebrityLife Activities team was fantastic. The crowd on board is largely composed of active retirees with very adventurous spirits, in addition to other cohorts sprinkled into the mix. Overall, we give our Celebrity Infinity Panama Canal transit a great review and is most worthy of RoamingAroundTheWorld’s recommendation. 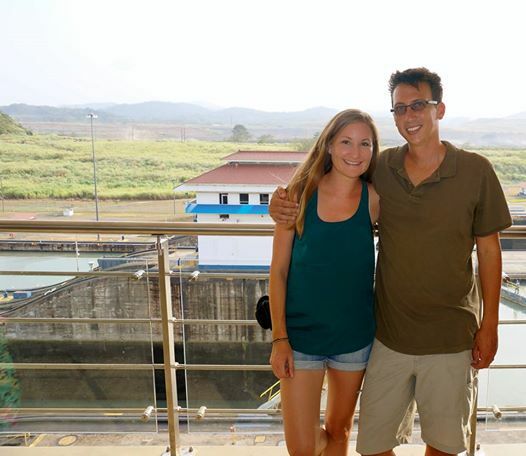 Excellent review and want to commend you both on all the details and helpful hints on how to prepare for the Panama Canal. We are going this year in May and are very excited. Have never traveled on the Celebrity infinity. Is it a nice ship? Is there enough activities and restaurants s on board? We have a balcony room. How are they? Thanks so much. If anyone can respond to these questions I would very much appreciate it. Hey Lori, thanks for the kind comment and questions. 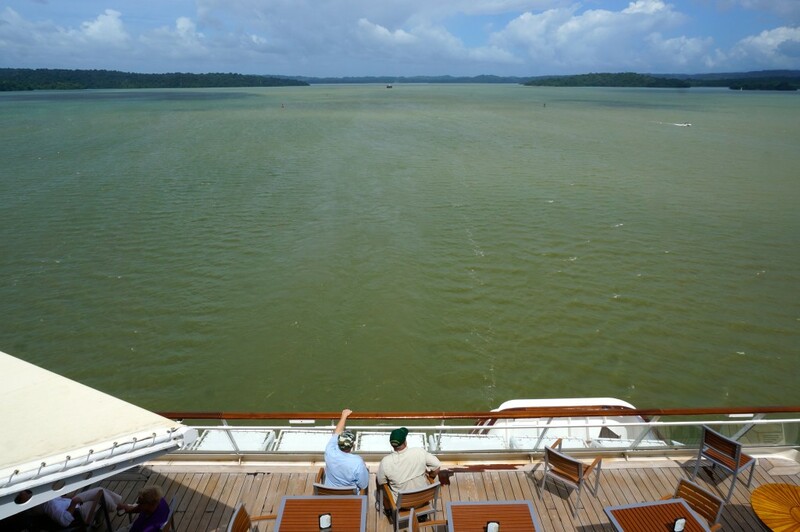 We’re thrilled that you found our article to be helpful while planning your Panama Canal cruise. The Celebrity Infinity is a fantastic ship. We particularly liked the indoor solarium and pool and found it to be the perfect place to relax. We had a balcony room and felt spoiled by the size of the room and the balcony itself is very spacious. We found the activities on board to keep us plenty busy during the sailing, as we’re the type to usually get pretty involved with the competitions and programs facilitated by the activities team. Daily team trivia was always a go-to. Enjoy your cruise this May, Bon Voyage! 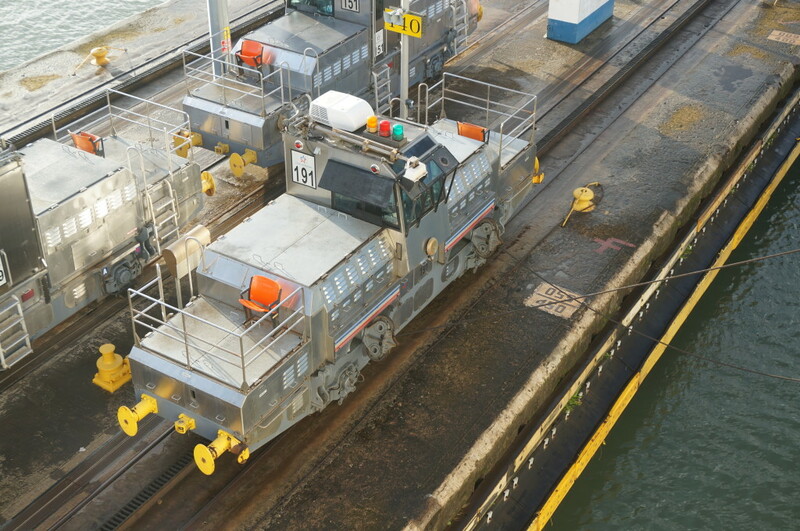 Thank you very much for all of your comments on a full transit through the panama canal. We will be sailing with Celebrity X (Infinity) on 24 November 2016, from west (San Diego) to east ending up at Fort Lauderdale. On 4 December 2016 we will be cruising through the panama canal. My husband and I love wildlife, and so look forward to seeing what we can spot as we go through the canal, which will give us another interest as well as the locks. I have made a note of all your tips, moving around the ship to get the different views, where to eat at lunch time to avoid the busy periods and about the humid temperatures through the canal. Your review is the best one that I have ever read and with lots of detail and photos. Thank you once again. We are getting really excited now as we have only just over a week to go to our holidays. Have a fantastic cruise and please let us know how it goes and if you have any tips for us following your cruise experience. Hi Anita, thanks so much for the comment. We’re thrilled to hear you found our cruise tips helpful. Have a fantastic time on your Christmas cruise! We’re going on the newly refurbished Infinity in November. I did transit the canal when I was doing a Semester at Sea, but we went during the night. Also a fun experience; we stayed up all night on deck, which was cooler, and made a party of it. This will be different and fun. Thanks for the tips. I think you’ll be in for a treat! I didn’t realize the Infinity was due for refurbishment. We thought the ship was in good condition when we sailed on her about a year ago now. I’d have to imagine they’ll be making the ship even better. How cool to have transited the Panama Canal at night while on SaS! I’d imagine you’ll be in for a different experience on the Infinity. It probably won’t be quite as big as a party, lol, but I hope you’ll find it just as fun and memorable. Happy travels! What a great review. Travelling over from Australia my partner and I will be sailing through the canal early April. Your advice was invaluable. Wishing you many happy future journeys. Thanks for the kind words! So glad to hear this was helpful. We hope you have an excellent voyage through the canal in April and enjoy every minute of it. Happy travel!